Buttercup Bingo | Get £15 FREE No Deposit - JOIN NOW! Buttercup Bingo is one of the top rated brand new bingo sites to premiere in the summer of 2014. The site is clad with a lovely cartoon farm theme and a sweet little cow with a bell greets players at the entrance of the site. 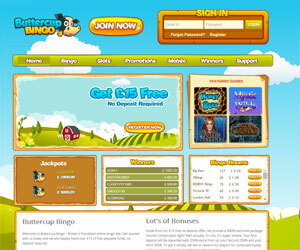 Buttercup Bingo is part of the Cozy Games network which is known for hosting top quality bingo sites. Buttercup Bingo certainly lives up to the Cozy Games reputation. To begin with, players who join Buttercup Bingo will receive £15 free with no deposit required right when they sign up. Additionally, once they spend their first £10 they'll get £45 to play with! After you've become a full Buttercup Bingo member you'll get access to all sorts of amazing promotions such as the Bingo Champions League which lets you team up with four bingo pals to achieve the goal of collecting as many full houses as possible. You'll also be able to earn extra cash when you refer a friend for £10 worth of Amazon shopping vouchers. New players have access to exclusive promos like the incredible 900% deposit bonus on your first three deposits. As a Buttercup Bingo member you'll get access to top slot specials like Losers vs Winners which gives you a chance to grab some free bingo cards and free spins to boot! If you're one of the top three losers at bingo and slot games then Buttercup Bingo will give you free spins and bingo tickets! There's also a fabulous Weekend Slots Tournament. When you fund your account with £25 you have the chance to win up to 50 free spins! What's more? Well, the Awesome 20% Slots Cash Back of course where you get a guaranteed 20% cash back after you spin to win! Buttercup Bingo offers players tremendous mobile gaming potions. Buttercup Bingo Mobile operates seamlessly on all Apple and Android phones, tablets and devices. When you join you’ll have the opportunity to claim a free £15 no deposit bonus. Moreover, after you’ve pocketed the no deposit bonus you’ll be able to claim an additional £35 bonus after making your first £10 deposit.With Buttercup Bingo Mobile you can navigate smoothly through a vast range of online slot games including Queen of Legends, Rubies and Sapphires, Treasures of Egypt and more. There's also a fabulous selection of mobile casino games to choose from such as Classic Blackjack, Roulette and of course the ever-popular Keno!